24. Abeyrathne E.D.N.S, Jayasena D.K.D.D. and Silva K.F.S.T. 2009. Development of Fruit yoghurt by incorporating pineapple (Ananas comosus) preserved in sugar syrup with preservatives and oven dried under vacuum. Sri Lanka Journal of Animal Production. Vol 05, Issue 01, August 2009. Sri Lanka. 79-88 pp. 25. Jayasena D.K.D.D., Abeyrathne E.D.N.S. and H.W. Cyril. 2009. Development of a pork based white sausage. Sri Lanka Journal of Animal Production. Vol 05, Issue 01, August 2009. Sri Lanka. 45-54 pp. 2. Ganegoda, G.V.N.K., Abeyrathne, E. D. N. S. and Ahn, D.U. 2015. Enhancing texture stability and gel formation of fish SURIMI produce from swordfish (Xiphias gladius) with replacing existent cryoprotectctants from ovomucoid. IFSTSL Research Session. 15th December 2015. Pp37-40. 15. Jeewantha, P.D.A. and Abeyrathne, E.D.N.S. 2015. Isolation and incorporation of Nitrogenous compounds from yellow fin tuna (Thunnus albacares) to produce a fish flavored vegetable burger. Proceedings of 5th Research Symposium of Uva Wellassa University. January 28-29, 2015. 16. Perera, R.W.M.E.D., Abeyrathne, E.D.N.S. and Lalantha, N. 2015. Development of tomato (Solanum lycopersicum) incorporated fish nuggets. Proceedings of 5th Research Symposium of Uva Wellassa University. January 28-29, 2015. 17. Mohamed, F.S. and Abeyrathne, E.D.N.S. 2015. Effect of tropical forages on growth performance and carcass quality of rabbits. Proceedings of 5th Research Symposium of Uva Wellassa University. January 28-29, 2015. 18. 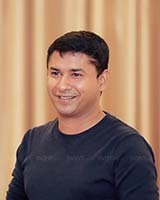 Wickramanayaka, T.D.G. and Abeyrathne, E.D.N.S. 2015. A study on microbial contamination, sources and preventive measures in butter production. Proceedings of 5th Research Symposium of Uva Wellassa University. January 28-29, 2015. 26. Lee, H.Y., Abeyrathne, E.D.N.S. and Ahn, D.U. 2012. Separation of Phosvitin from Chicken Egg Yolk without Using Solvent. KoFoST2012, Daejeon. 27. Abeyrathne, E.D.N.S., Mudannayake, K.M.D.C., Cyril H.W. 2010. Development of a crispy snack by incorporation of chicken gizzard and liver with rice flour. Proceedings of the Research Symposium of Uva Wellassa University. September 2010. Sri Lanka. Pp 165. 28. Bandara U.S.R.T.A, Abeyrathne E.D.N.S, Cyril H.W. 2010. Development of a burger using chicken meat, liver and gizzard with locally available cereal as a filler. Proceedings of the Research Symposium of Uva Wellassa University. September 2010. Sri Lanka. Pp 21. 29. Kanojan K., Perera M.D.C.A, Abeyrathne E.D.N.S, Jayamanne S.C. 2010. Development of HACCP plan for steam boiled crab meat from Asian Blue Swimming Crab (Portunus Pelagicus). Proceedings of the Research Symposium of Uva Wellassa University. September 2010. Sri Lanka. Pp 23. 30. Niruba, S., Abeyrathne E.D.N.S., Jayamanne, S. C, Jayasena, S.H. 2010. Improve the export quality of Sword fish steak by incorporating low valued fish (Lates calcarifer,Catla catla,Lutjanus campechanus) and root crops (Solanum tuberosum, Ipomoea batatas, Solenostemon rotundifolius) in order to reduce the initial mercury of Sword fish. Proceedings of the Research Symposium of Uva Wellassa University. September 2010. Sri Lanka. Pp 30. 31. Thilakarathne G.D.M, Abeyrathne E.D.N.S., Jayamanne, S. C, Jayasena, S.H. 2010. Development of fish cake by incorporating off-trimmed of Sword fish (Xiphias gladius) and Tuna (Thunnus albacores) with a suitable local available fillers Rice (Oryza sativa), Kurakkan Powder (Eleusine coracana) and Soya Flour (Glycine max). Proceedings of the Research Symposium of Uva Wellassa University. September 2010. Sri Lanka. Pp 20. 32. Piyasena, K.M.P.K, Abeyrathne E.D.N.S, Jayasena D.K.D.D., Boraluwa C. and Cyril H.W. 2010. Development of HACCP plan for Formed Meat Production Line at Gills Food Product (Pvt) Ltd. Proceedings of the Research Symposium of Uva Wellassa University. September 2010. Sri Lanka. Pp 22. 33. Weththasinghe, M.P., Abeyrathne, E.D.N.S., Karunarathne, B. 2010. Investigation of occurrences of mercury level in tuna fish (Thunnus albacarus) in relation to its habitat & size variation. Proceedings of the Research Symposium of Uva Wellassa University. September 2010. Sri Lanka. Pp 33. 34. Wijesekara, W.L.U., Abeyrathne, E.D.N.S., Ganegoda G.A.P., Samarasinghe, K. 2010. Waste minimization of poultry feed processing through Cleaner Production. Proceedings of the Research Symposium of Uva Wellassa University. September 2010. Sri Lanka. Pp 39. 1.Inventors: Illangakoon, I.M.I.V. and Abeyrathne, E.D.N.S. 2.Inventors: Dong Uk Ahn, Sandun Abeyrathne, H.Y. Lee. Team leader for the “Student Assessment and Awards” for the institutional review of Uva Wellassa University, 2017. Secretary of the Faculty of Animal Science and Export Agriculture for the Uva Wellassa University Research Symposium, 2015. Secretary of the Animal Science Course committee from April, 2014 to April 2015.